Sat., Sept. 21, 2013, 10:08 p.m.
By his own admission, Adam Morrison has gone to the dark side. No, not of the moon or the Star Wars’ version. 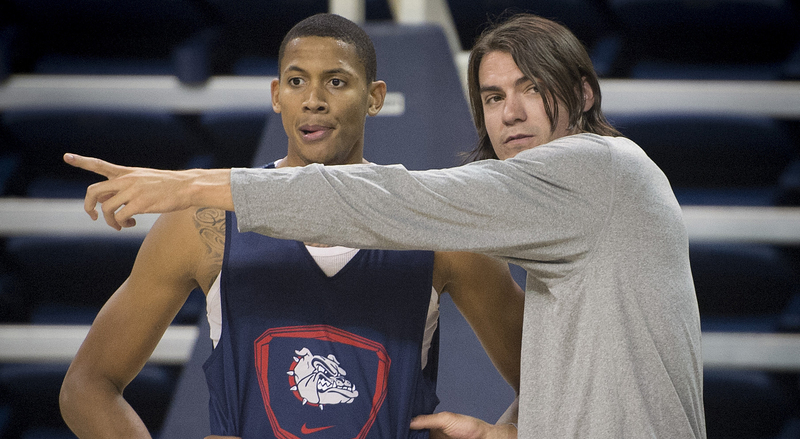 He’s patrolling the sidelines just like his dad, John, albeit at the bottom rung of the coaching ladder as the newest addition to Gonzaga’s basketball staff. At practice earlier this week Morrison pulled Louisville transfer Angel Nunez aside for a brief chat, gesturing to a spot on the court to emphasize his point. Morrison then walked to the other end of the floor to help five players learn an offensive set. Morrison eased into coaching last year at his alma mater, Mead High School. He has graduated to his collegiate alma mater, Gonzaga, where he became the nation’s leading scorer in 2006, adorned magazine covers, shared player of the year honors with Duke’s J.J. Redick and was eventually selected by Charlotte with the third pick in the NBA Draft. It’s a good place to be, especially for Morrison. He’s a student assistant, where he can do what most coaches do with the exception of recruiting and he probably won’t be breaking down video since he’s carrying 18 credits. Morrison, 29, is basically a scholarship student-athlete again, back in class with his education paid for by the university but with different duties on the court. He knows all about doors closing on him during a checkered NBA career. A prolific scorer at GU with five games of 40 points or more, Morrison averaged 11.8 points as a rookie with Charlotte but lost his starting job midway through the season. Then came a torn ACL and a lost season, a new coach, a trade to the Lakers and a couple of seasons where he was pretty much a fixture at the end of the bench on two championship teams. He launched a comeback attempt overseas and played well, drawing interest from NBA teams. He averaged 20 points per game for the Clippers’ summer league team. He had a brief stay with Portland but was released roughly 11 months ago. Morrison is pragmatic about his NBA career. Morrison always knew he’d transition into coaching at some point. His dad, a collegiate coach with stops in Wyoming, South Dakota and Montana, coached Adam through eighth grade. Morrison exited Gonzaga for the NBA after his junior year, leaving about a year of classes to finish his sports management degree. Lloyd has stressed numerous aspects of Morrison’s game to GU players in recent years. Asked if he was easy to coach, Morrison pauses for a second. Morrison is fully aware of the opinions others have formed about him and his NBA career. He offers a typically blunt reply on the topic of his image. He’s already making an impression on the players. Morrison’s role will become more defined over time but he enjoys being part of a team again. The players refer to him as Adam or Mo, not coach. Morrison’s imprint on the program is unmistakable. Like any good coach, he’s preparing for every situation. For example, will he wear a tie on game day? Published: Sept. 21, 2013, 10:08 p.m.